Do you like Fun? Do you like Math? 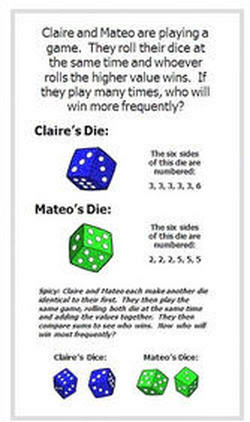 You might just like these Math-Fun (courtesy of San Francisco Math Circle - our partners)!! Check out this YouTube Video by Paul and our colleagues on what makes a good problem? Like what you see so far? Subscribe to our monthly newsletter for happenings in our math world! Math Circles are a form of education outreach and enrichment through which mathematicians and mathematical scientists share their passion with K-12 teachers and students. 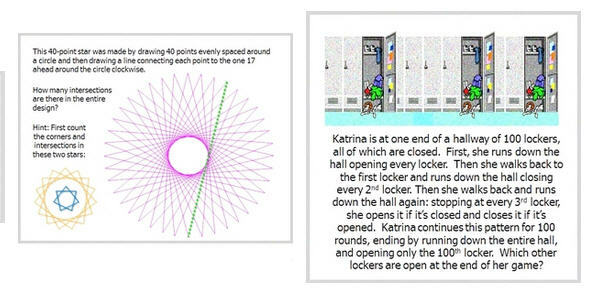 The Math Circle landscape includes two types of programs that can operate standing alone or in coordination: Math Students’ Circles and Math Teachers’ Circles. Math Circles bring K-12 students or K-12 mathematics teachers together with mathematically sophisticated leaders in an informal setting, after school or on weekends, to work on interesting problems or topics in mathematics. The Math Circles combine significant content with a setting that encourages a sense of discovery and excitement about mathematics through problem solving and interactive exploration. Ideal problems are low-threshold, high-ceiling; they offer a variety of entry points and can be approached with minimal mathematical background, but lead to deep mathematical concepts and can be connected to advanced mathematics. ABOUT: The MathPi Academy Elementary Math Circle is fashioned after the San Francisco Elementary Math Circle and is "an alternative math enrichment program designed to develop a positive attitude towards mathematics by introducing young children to elements of mathematical culture". Towards this end, we carefully select engaging mathematical puzzles and games on topics chosen from higher mathematics including number theory, game theory, combinatorics, probability and statistics, abstract algebra and topology. The children are exposed early on to the world of mathematical reasoning and problem solving and develop habits to tackle unusual problems that would stimulate the mind. MATH CIRCLE WITH MATH COMPETITION PROGRAM: With our extensive background in competitive mathematics, we have found that the national and international mathematical competitions can be a fun, yet engaging way of stimulating student interest in problem solving. In addition, the structure of a math circle program enables us to provide students with out-of-the-box thinking strategies that aid problem solving and has been shown to create successful mathematicians. Many of the math circle graduates go on to win and excel in prestigious national and international contests and our team's own experience with both participating in as well as coaching international Olympiad teams make us ideally suited for competition coaching, that is embedded in our weekly problem solving sessions. Class Levels: We run 3 levels of Math Circles: 1st - 2nd grade (Elementary Circle 1); 3rd - 4th grade (Elementary Circle 2); 5th - 6th grade (Elementary Circle 3). We run a Concentrated Math Circle that focuses on Competitive Training. 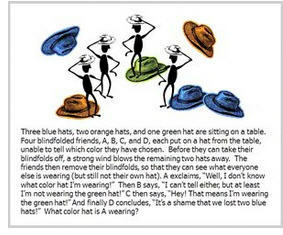 In the October of 2016, in partnership with The Gifted in Fremont, we are piloting a new circle for 4th - 6th graders (advanced 4th graders should consider this circle) - this is a "mixed grade circle" with challenging math activities focusing on logic and step-by-step mathematical proofs. Our Spring 2017 session will have additional circles....keep an eye out for registration information!! Please visit our Registration Page for details and to register !!! *All dates and times are tentative and subject to change. COMING SOON IN SPRING!! - MATH KANGAROO AND COMPETITION TRAINING!! What is unique about MathPi Academy? We are a Math Circle - we provide customized mathematical training based on proprietary intellectual content designed by the Math Circle Teachers and the American Mathematical Society instead of scripted textbooks and market based curriculum. How is MathPi Academy different from my local math coaching centers? All our instructors are current U.S. University Professors with decades of higher education experience. All of our instructors are members of the Math Circle Teacher's Network and undergo weekly seminar and group meets to continuously update the mathematical training program for school-aged children. How affordable is MathPi Academy? Our rates do not exceed $25 - $30 per session (no registration, no material fee). We also offer sibling discounts. The normal charge at local math tutorial homes range from $45 - $50 for each session with annual registration as well as material fees. We also provide 10% sibling or multi-session discount. How can you afford low cost when local tutorial homes charge a premium? We are a Math Circle under the affiliation of National Association of Math Circles and we are designed to offer affordable mathematical education. We seek grants from the American Mathematical Society and local school districts and work in partnership with them, keeping the cost low for all our curious kids. Do you have expertise in Math Competition training? Yes. As mentioned, all our teachers are members of Math Circle teacher's program, many of whom are actively involved with competitive coaching. For example, Professor Paul Zeitz is the co-founder of the Bay Area Mathematical Olympiad and the U.S. International Olympiad team coach. Is this program suited for my child? Try us out! We just have a semester's worth of commitment! Every child who is curious is welcome to our club! We discover Maths jointly -it is a journey for us! Join us and experience for yourself! Do you provide coaching for school assessment like Smarter and Balanced Testing? Yes! While our main goal is to foster mathematical training in the spirit of a Math Circle, on popular demand, we will be expanding our repertoire to include preparation for Smarter and Balanced Testing. Our director is the Faculty Director of Curriculum Development at University of San Francisco and has extensive experience working with WASC - the accreditation committee of Western Schools and Colleges which guide our materials for Smarter and Balanced Course preparation.